It's a loaded question for many women, especially Latter-day Saint women, who recognize the sacred calling of motherhood but sometimes feel overwhelmed — and undervalued — in their roles as mothers. Author Jane Clayson Johnson has been asked that question on many occasions since trading in a prestigious and rewarding career in network news for the equally challenging career of motherhood. And, like most mothers, Jane has hesitated before answering the question. Her testimony of the gospel and refreshing candor about the realities of motherhood create an immediate connection between reader and author and will inspire women to change the way they feel about being mothers. Whether you're a mother of young children or are approaching the empty-nest years, you will find affirmation in this book that mothers matter. “You matter,” Jane reminds women, because “a mother's work is God's work” — even on the days and nights that challenge your strength and test your character, and even when the world works overtime to minimize your calling. Chapter Five: Can I Quit Now? Heard about the book from a friend and love reading it. I loved this book. It is really inspiring for LDS mothers to be proud that they are a mother. I heard Jane Clayson Johnson at Time Out for Women and found her very inspiring so I bought her book. It made me feel the worth of what I do each day when it sometimes feels monotonous and unimportant. This was my mother's day gift! I got this book from my mother in law for mother's day and it came at a perfect time-I have been struggling to really embrace my role as a mother of three small children without missing my teaching career too much. I really appreciated what the author had to say and it caused me to looka t my role as a mothe rin a different, more eternal light. thanks for a great book! This is a beautiful tribute to motherhood. A definite must-read. 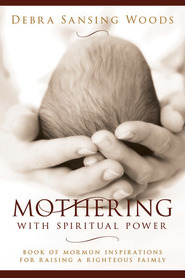 I received this book as a gift at a time when I really needed to be reminded of the joys and gifts of motherhood. The author inspired and comforted me with her candid style. I bought this book as I contemplated how my life would change as my son started kindergarten. It gave me reassurance that the choice I made to stay home with him was worthwhile and that both my son and I would be blessed because of that choice. For someone who is not yet a mother but has been contemplating very seriously about when to start our family, this book was an incredible read for me. I felt as if the author was writing it just for me. I have struggled with how the world see's success as someone who has a great career and puts motherhood second in life; and yet the gospel teaches us that motherhood is the most divine and important responisiblity we will ever hold. This book was such an encouragement and reminder of how important motherhood and womanhood really is. I wanted to go and buy a copy for my mother and all my sisters to read! Next to the scriptures, this is my FAVORITE book! I LOVED this book! It was just what I needed. I borrowed it, but will buy it soon to have around for reference and for reading on those hard days. I read a review on amazon about it that was so negative and I loved this book so much that it made me want to cry! I think that in writing this book Jane has blessed and will bless so many lives! I think my kids will have a happier mom now! I loved how Jane shared her life experiences touching on the tender parts of her mind and heart. It made me look at my own life, what I had mapped out for myself and how the lord has steered me when I have made his will my own. I felt very inspired by the read as if it was a cross reference for the proclaimation on motherhood as it supported the feelings and importance attached with nuturing gods own. I loved the story on pg 114 ... and her mind set ... that really stood out for me and I would encourage anyone struggling or feeling out of gas this was the key to rejuvenation and enjoyment as a Mother. I received this book as a gift from my sister- a truly inspired mother. I loved reading every page and felt uplifted and encouraged. As a young mother of four and expecting our fifth child, I was reminded what the 'Big' picture really is. I don't have to be a Supermom, I can enjoy my children and create lasting memories with an eternal perspective. Thanks to all the mothers who have contributed to my life. This book is a must own! I absolutely loved this book! It was such an encouraging and uplifting experience. As I was reading, it felt as if this book was wrote just for me! Thank you! My friend gave me this book for my birthday. I have read it slowly over the last several months...not because I didn't want to read it fast, but because I wanted to savor and truly enjoy every word on every page. , Thanks for a peak into your amazing and yet average life, Jane! You are an inspiration. This is one of those books that you will read and then want to go out and buy a copy for every mother or future mother you know. There are so many parts where I thought, 'Yes! Exactly!' and often, quiet moments, where I felt like someone had overheard my prayers. This book was sorely needed, which is why I think it's being received with so much enthusiasm. Wonderful! A truly inspiring book for every woman to read! Sister Jane Clayson Johnson, through her own story and outside resources, shares thoughts on motherhood that every woman (and the men in their lives) can benefit from. Overall, I found the book comforting and inspiring. It left me with the feeling that I am truly not alone in my efforts to be a good mother and that my calling is of the utmost importance both in the world we live in and eternally. Thank you, Jane, for you inspired words! This book reminded me to be proud of being a mother.